Creative Team member Jeanne Streiff has combined the Hometown Christmas Collection with Color Burst to create two very striking Christmas cards that would be joy to display on any mantle this Christmas. Hi! 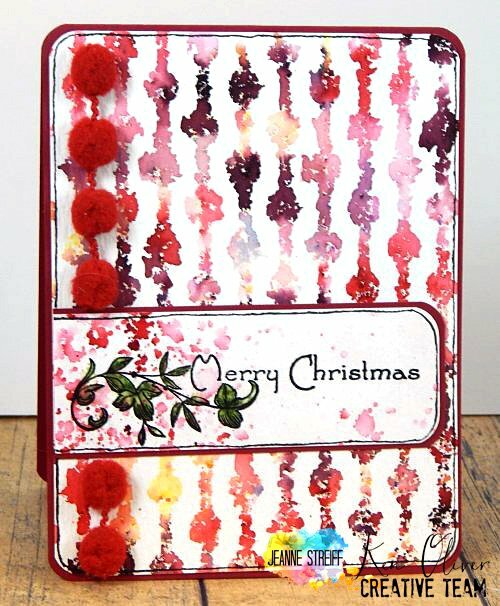 I'm happy to be here today to share a couple quick and easy cards using Color Burst (Alizarin Crimson, Merlot and Lemon Yellow) and Hometown Christmas Collection Set 2 clear stamps. I sprinkled Color Burst (Alizarin Crimson, Merlot and Lemon Yellow) onto a stencil on watercolor paper and then misted lightly with water. I carefully removed my first paper and then put another piece of watercolor directly onto the stencil. Two different looks with a single Color Burst application. How fun!